"Want a Ready Made Welding Table?.. " 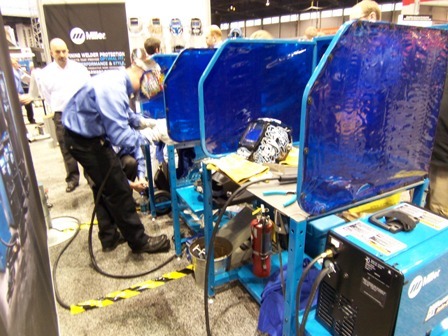 What new products was Miller Welding company displaying at the 2009 Welding Expo? They are calling their welding table the "ArcStation" and it looks like a pretty decent deal for the versatility that is built in to this Miller welding table. Starting at 352 dollars for the smallest and most basic welding table with no extra features, its still a pretty good deal. If you have ever priced metal to build your own, and value your own time at even 5 bucks an hour, you will understand that sometimes, a prebuilt welding table is a better way to go. Miller ArcStation welding tables are available with a 3/16" or 3/8" thick table top that has an X slotted pattern for using Miller's hold down clamps. A shelve on the end holds a Miller Dynasty or Diversion nicely along with a place to hang the torch and it has ball bearing track drawers to keep hand tools in. There are holes predrilled strategically all over this thing as well as attachments to let you quickly mount a vise , hang a grinder, or other accessories, and there are places to hang C clamps out of the way too. Leveling feet allow for a level work surface too. A welding curtain option makes the ArcStation a good way to demonstrate welding in a training environment or out in the middle of the shop floor without the risk of flashing onlookers. The ArcStation Miller welding table is modular too…meaning you can basically build your own Miller welding table to suit your needs. For example, lets say you don’t want the tool drawers, or you don’t want the Dust tray. You just don’t order it. You only pay for what you want. With the order form Miller uses, you have the flexibility to get only the features you want and not pay for the rest…. but be aware , if you get every single upgrade, the price grows quickly. You can order the most basic 30S model ArcStation welding table with a 30 " x 30 "inch 3/16 " thick steel top and no X pattern slot and a $352 list price…. 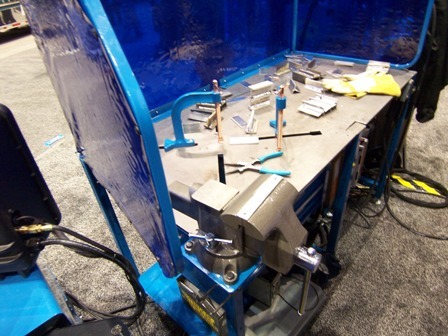 If you need a more precise welding table with a more extensive line of tooling and clamping devices, check out this Strong Hand Welding table That has all kinds of clamping devices and fixturing available to hold absolutely any shape you can think of.